Many families impacted by the Oklahoma May 2013 tornadoes and severe storms have recovered or are well on their paths to recovery. But we know that recovery is a long and difficult process. For those in our communities who still have disaster-related unmet needs, we want them to know assistance is still available, even now – months after the tornadoes and severe storms ripped through our state. Many of those affected may have had insurance and/or FEMA resources but are now finding those are not enough to meet their disaster-related needs. They may even feel they would not qualify for disaster assistance because they were insured or had already received assistance. The Oklahoma Disaster Recovery Project would urge them to speak to one of our case managers to see if they are eligible for assistance, which may include housing repairs and materials, addressing mold issues, funding for rebuilds or major repairs that insurance or FEMA did not cover, fencing or sheds, relocation costs, furniture and appliances, medical needs, spiritual and mental health services, transportation, and more. 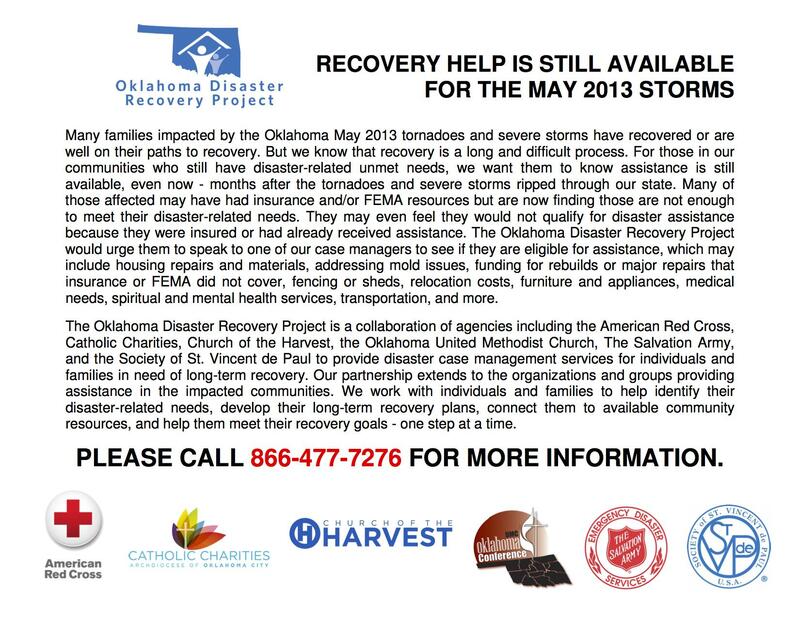 The Oklahoma Disaster Recovery Project is a collaboration of agencies including the American Red Cross, Catholic Charities, Church of the Harvest, the Oklahoma United Methodist Church, The Salvation Army, and the Society of St. Vincent de Paul to provide disaster case management services for individuals and families in need of long-term recovery. Our partnership extends to the organizations and groups providing assistance in the impacted communities. We work with individuals and families to help identify their disaster-related needs, develop their long-term recovery plans, connect them to available community resources, and help them meet their recovery goals – one step at a time. PLEASE CALL 866-477-7276 FOR MORE INFORMATION.